Even in sunny Southern California, Labor Day weekend marks the end of summer and in craft beer terms, signals a reduction in the availability of the fantastic summer beers that have hit the market this year. So before we dive into fall and the impending wave of pumpkin madness, I wanted to sample one more Session IPA, capping off a season rich with brews like Easy Jack, Go To IPA, and a parade of incredible Pils’ and Lagers. 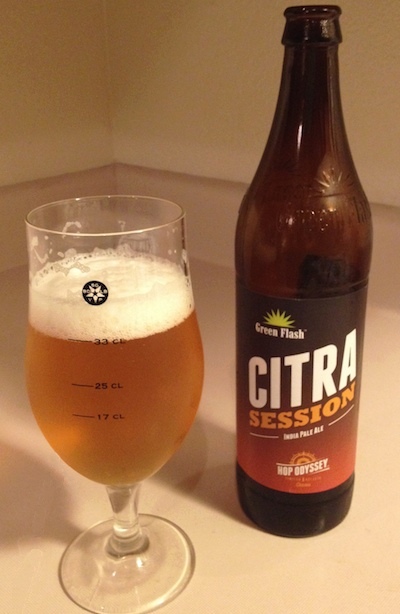 In my search I was happy to find Citra Session IPA, a session-able single hop offering from Green Flash Brewing. 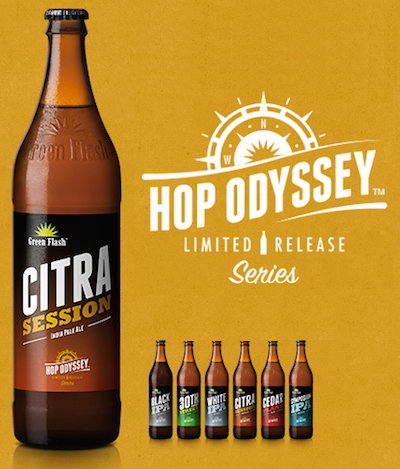 The fourth edition of the yet to be completed Hop Odyssey series, Citra Session pours a light golden straw color with exceptional clarity. A fluffy white head of intricate bubbles recedes slowly leaving subtle lace. The nose is a big bold dose of tropical fruit, lemon, grapefruit, orange, and pine. A very inviting fresh hop aroma from the copious amount of Citra hops. Taste follows suit with a punch of fruity hop flavors, mainly citrus riding on a light to medium body as it coasts to a nice hop bitterness on the back end that knocks nothing out of balance. Body and mouthfeel are crisp and refreshing, with no lingering aftertastes, adding up to a great session beer that leaves you wanting more. Lemon and grapefruit rind play more prominently as the beer warms. This is a great Session IPA with a deserved rating of over 90 on Beer Advocate. The body is just right for an easy-going summer drinking experience. The pronounced hop character of this brew is exactly what I expected from Green Flash’s take on this newly popularized style. I say find this one while you can, and look forward to the last two Hop Odyssey releases; Cedar Plank and Symposium IPA.